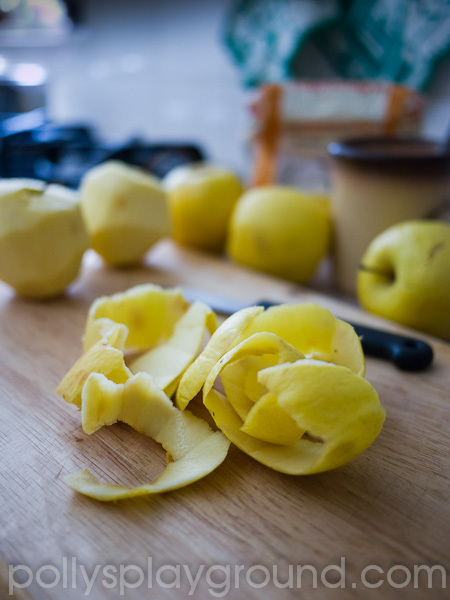 Last week I came down with a serious case of sad apples and, aware that the symptoms of shriveling skin and spreading soft spots would only increase if ignored, I needed a treatment - fast. Unfortunately, two flats of applesauce are already stored in our basement (not exactly unfortunate; it is excellent applesauce, hence the two flats). Wanting to avoid traditional medicine, I scoured the net for alternative therapy. My attempt was in vain. With approximately 3.14 usable apples, naturally the answer was pie. Let's just preface by saying (again, because I am certain I have said it before) that I am not a pastry chef. I'll go one step farther and admit that my fear of insulting the crust goddesses in my life (and yes, I'm lucky to have a few) makes me shy away from the pie tin (unless it's full of pie, then I grab a fork). Like "look both ways before crossing the street" and "don't take what isn't yours", "pie crust isn't easy" is a rule that was deeply ingrained at an early age. Alas, since this isn't a matter of life and death (except for the apples), and it isn't illegal (though maybe it should be), I'll use my best judgement and downgrade the rule to a guideline. 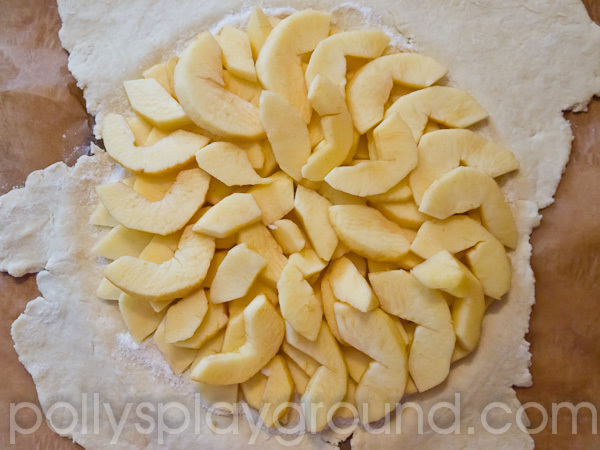 Besides, I'm old enough to know now that pie crust is actually pretty easy; it's good pie crust that eludes. I found a lovely recipe at Food & Wine Magazine for a good sounding apple tart; ideal for people like me who don't actually own a pie tin (did I forget to mention?) The recipe seemed like it could be the cure, specifically calling for golden delicious apples (exactly what I had...when does that ever happen?) and, most importantly, was not for just any old apple tart; it was for RUSTIC apple tart. Rustic I can do. Now comes the hard part, which won't be so hard if you pay attention to the important parts. The pie crust ingredients are, in fact, very simple: 1 1/2 cups of flour, a pinch of salt, 6 oz cold butter (for the love of pie, people, please use real butter) and 1/3 cup of ice water. If I had a siren I would sound it now. ICE WATER. Here is the (sort of) science behind the secret of successful pastry. As the fat (butter) increases in temperature, it releases its water content. When flour gets wet, it develops protein strands (gluten). While you do need a small amount of liquid to form the dough, too much wet will result in too much gluten. Gluten is extremely elastic and makes your dough hard to roll, become stretched when you do, and shrink when it's baked. All of this adds up to the reason why four out of five dentists¹ claim that gluten is the leading cause of tough pastry (and we've been trusting those dentists for years). Please keep your fat from sweating; use ice water and chilled butter. In the actual recipe, we are instructed to pulse the ingredients in a food processor for various lengths of time and intervals blah blah blah. That didn't sound very rustic to me (and I don't own a food processer) so I substituted my hands and two knives (much easier to wash, if you ask me... which you didn't, but I'm just saying...) I mixed the flour and salt really well, then chopped the cold butter into small cubes (quickly so it didn't warm up) and cut it in to the salted flour until it resembled little peas (but not green). The food processor people should be able to do this in about five seconds. It took me about a minute. Next, I sprinkled my ice water (just the water, not the ice) over the pea-ish buttery salted flour and quickly mixed it with my fingertips (after holding a large block of ice to lower the body heat factor - true story) until it was just moistened, then turned it onto my lightly floured rolling board, gathered it all together into a ball and kneaded (kneaded? kned?) it just a few times until I had a genuine solid mass of (still flaky) dough. Ideally (back to the science end of things) you would put this dough ball in the refrigerator for the night but, since my main concern was making sad apples happy and not making perfect pie crust, I sacrificed and kept on going. Besides, who decides today that they'll feel like pie tomorrow? If you are with me on team instant gratification, please continue. If not, put your dough in the fridge, wash your food processor, and continue below tomorrow. Okay. 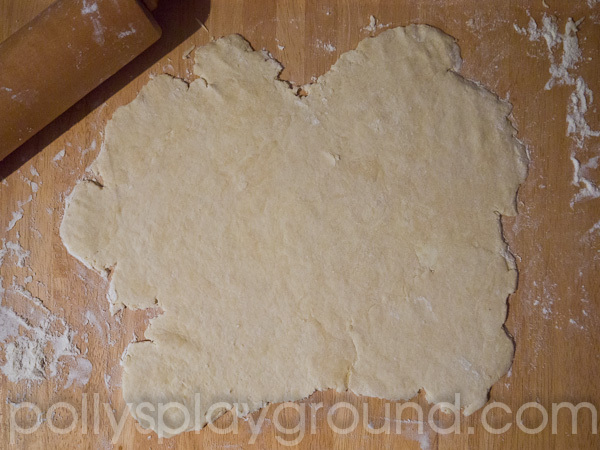 On a lightly floured surface, roll the dough into a large amoeba shaped figure about 1/4 inch thick. No, of course Food & Wine did not suggest an amoeba shape, but I'm hanging on hard to rustic (you are welcome to try it their way with a 16 - 17" round). 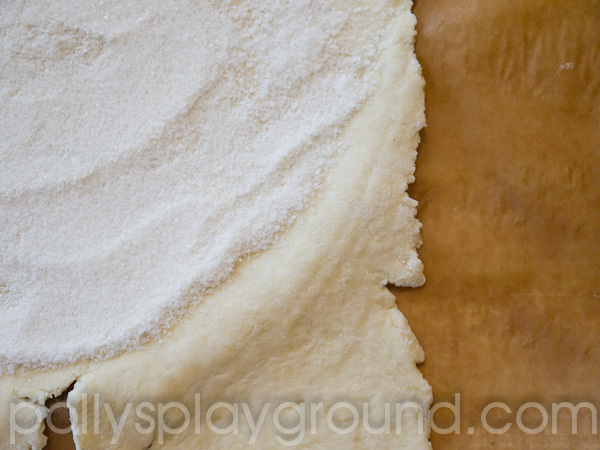 Regardless of what shape you choose (and it may not actually be a choice - sometimes you just get what you get), roll the whole flat around the rolling pin, then unroll it over a large, unrimmed baking pan that you've lined with parchment paper. I know that those of you who have been following me for awhile will remember that my most reliable oven for baking does not allow room for anything large, so I just used the bottom of a 9" springform pan and proved another fine example of 'work with what you've got'. 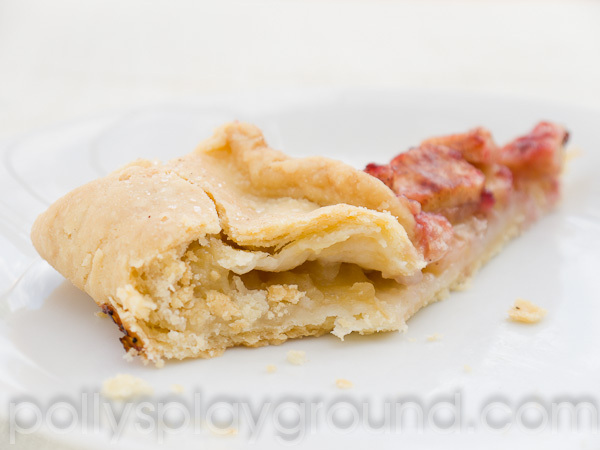 Next, combine 2 tablespoons of flour with 1 teaspoon of sugar and sprinkle it over the dough. 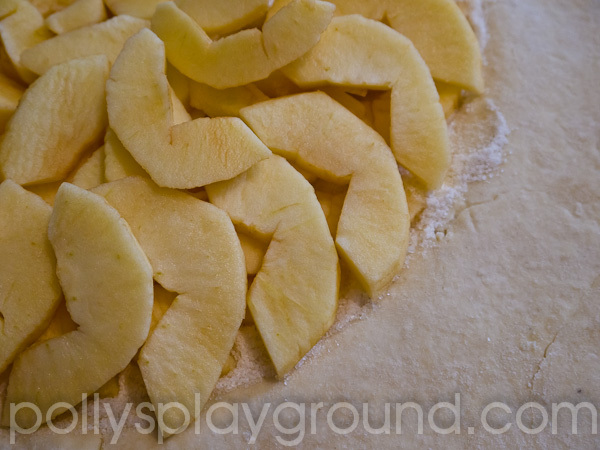 Arrange the sliced apples on top in an overlapping fashion. Leave 3-ish inches of border that you will fold over them when you are done. This will all rely on using your own judgement based on your pan choice and dough shape - but I promise, you can do it. Rustic. 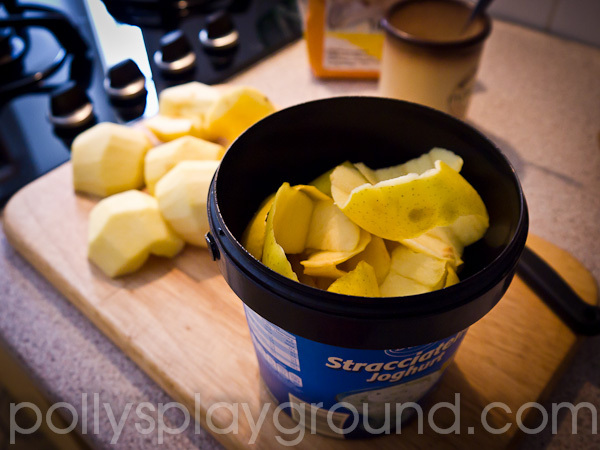 Once your apples are all tucked in with dough edges all around, brush them (the apples) with 2 tablespoons of melted butter, then sprinkle with 1 1/2 tablespoons of sugar. I also gave mine a few uncalled for shakes of cinnamon (I know, I'm such a rebel). After patting yourself on the back with your floury hands, put the whole thing in the fridge to chill while you wait for your oven to heat to 400 F / 205 C. Pop that beauty in the oven and set your timer for an hour. Since we've got an hour to kill, I'll tell you about the last time I baked rustic apple anything. When I was about 12, we had an apple tree. We also had a wood stove with an oven. One day my best friend (The Other Hannah) and I decided it would be a lovely idea to bake homemade pie. We picked all of the apples and lit a nice fire in the stove. We didn't know anything about chilled butter or ice water back then, but we mixed and rolled and assembled and baked at whatever temperature the fire gave us. We were extremely proud of ourselves and the (big) trouble we found ourselves in for lighting the wood stove when nobody was home was well worth our efforts (sorry Mom and Dad). It was truly the best. pie. ever. That's rustic! Note: If you are reading this and happen to be at the age of 'don't light fires without parental supervision' please do not attempt to try this at home. Check on your pie. When your crust is golden and your apples are tender, remove it from the oven and brush the apples with 2 tablespoons of melted apricot preserves. If you don't have any apricot preserves, try pineapple. If you don't have any of that, skip it. I believe it only serves the purpose to make it shiny and beautiful (but perhaps I am wrong.. it happens). Do NOT brush it with 2 tablespoons of melted berry preserves, which is all I had. It won't ruin the taste, but it will look like you had a serious knife accident and bled all over your pretty tart. Anyway, brush it or don't, then slide the parchment paper (and pie) on to a wire rack (or four wide mouthed tea cups if you lack one like me) to let the tart cool slightly before serving. That's it. We're done! Aside from the red preserves mishap, my apple tart was a hit. The pastry was flaky and the filling was tasty. My apples were happy. Rustic works. And pie IS the answer (to everything). ¹No dentists were actually surveyed with regards to the properties of gluten for the purpose of this article. 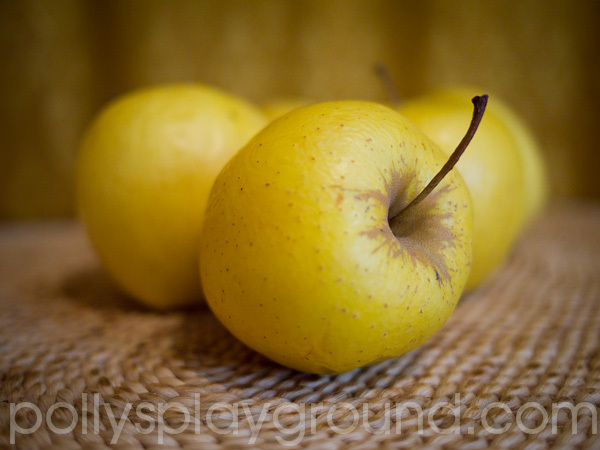 Want to see more Sad Apples? Feast your eyes at flickr. Want to bake this? 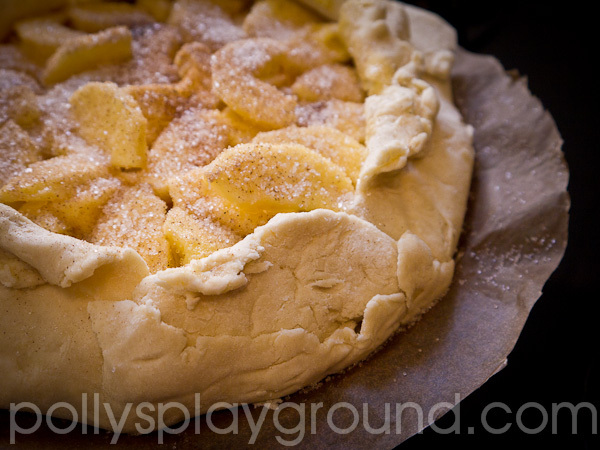 Cut my babble and grab the recipe for Rustic Apple Tart from Food & Wine. Please don't forget to share... Post your own photos and stories at The Perfect Avocado on Facebook. 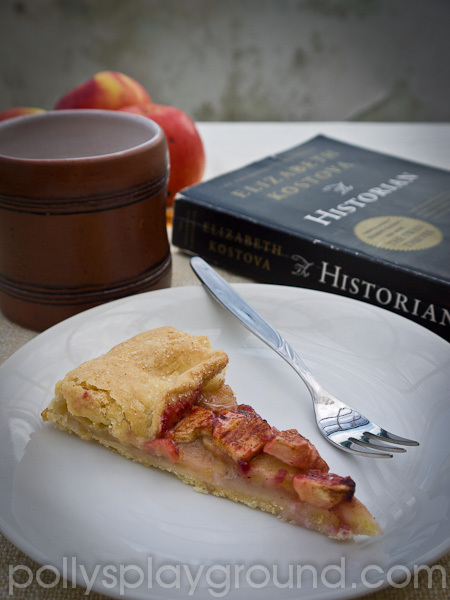 Mmm, now I want apple tart!! Don't have any sad apples ... I do have close to a zillion frozen bananas though, so need to use them up! Yeah, banana tart doesn't sound very appealing! Mmmmm....I think I have to try this. And I don't remember the Hannettes making apple pie in the wood stove, but if it launched Hannah W-R on her career and you on your blog, then you are forgiven. But children and youth should still heed your warning to not try lighting the fire on their own. i think getting in trouble is much more memorable than giving trouble. it was probably short lived anyway... i'm sure we sedated you with pie.